DADA Consultancy B.V. (DADA) is a premier and independent consulting agency. 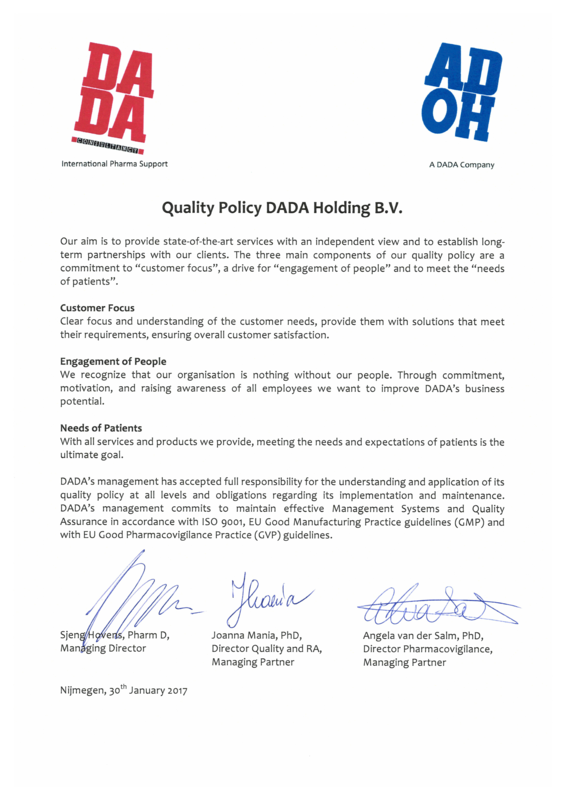 DADA has established its sound reputation as a highly specialized, reliable partner of international pharmaceutical companies. We offer a full range of tailor-made developmental and international regulatory affairs and pharmacovigilance services in the fields of human and veterinary medicinal products, nutraceuticals, herbal medicinal products, medical devices and cosmetics, covering all European Member States and related regulated markets. The DADA-team consists of dedicated and highly trained professionals in the pharmaceutical and biomedical field who are supported by a network of external experts, whenever necessary. In this way, DADA is able to provide the best possible services and to find solutions for your challenges. Our aim is to provide state-of-the-art regulatory affairs and pharmacovigilance services and to establish long-term partnerships with our clients. We have standing partnerships with over 50 international pharmaceutical companies, both human and veterinary. For some of these companies DADA acts as their “virtual private” regulatory affairs or pharmacovigilance department, looking after all required activities. We manage personal data in line with the GDPR requirements, please read our privacy statement. At DADA we have a passion for detail while maintaining focus on our client’s ultimate goal. We often solve uncommon problems with uncommon approaches, unlocking your data’s full potential. If you are stuck with an issue that seems unsolvable, or are in need for unlisted services, we invite you to contact us. We will give our utmost in helping you out, and in the unlucky chance that we cannot, we will still help you further and find the expert who can. Our company was founded by Mr Erik Dammers, PharmD, former managing director and still concerned with the business as an external advisor. Since 1984 DADA is based in Nijmegen, the Netherlands, and has come to an excellent working relationship with the Dutch Medicines Evaluation Board. DADA Consultancy has recently obtained ISO 9001:2015 certification. DADA Consultancy is a member of the Regulanet network.